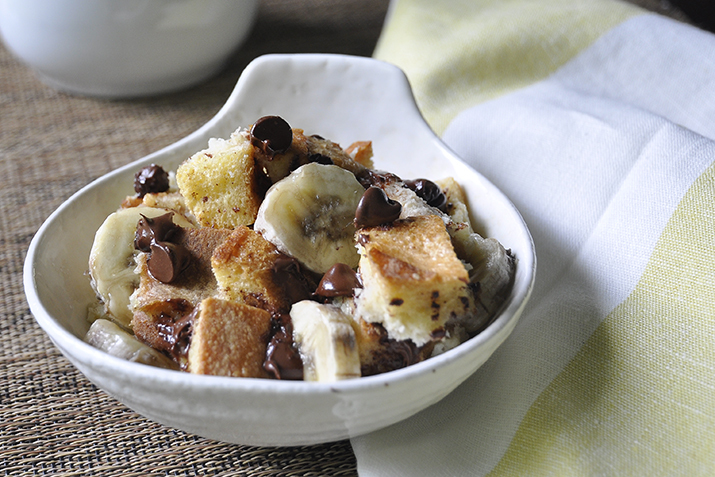 This scrumptious bread pudding recipe is easy to make and even easier to fall in love with. Preheat oven to 350°F. Use melted butter to grease a 9x13-inch casserole dish. In a large mixing bowl, whisk together the eggs, milk, sugar, rum, vanilla and salt. Add the cubed bread and toss gently to coat. Gently stir in the bananas and chocolate chips. Pour into the casserole dish and sprinkle brown sugar and pecans evenly over the top. Let the pudding sit for 20 minutes in the refrigerator, then bake for 40 minutes. The pudding is done when the edges start to brown and pull away from the sides of the pan. Slice into 2” x 3” rectangles, and serve hot. This sweet treat was originally developed to celebrate Fair Trade Month (October), so be sure to use Fair Trade bananas and other ingredients where available. Add Kahlua instead of rum, or try substituting apples, raisins and a dash of cinnamon for the bananas and chocolate.